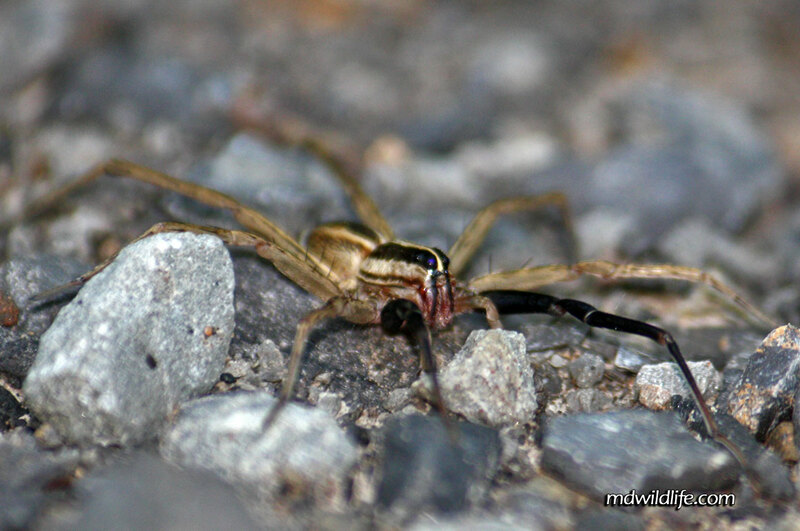 A Rabid Wolf Spider at Dan's Mountain shows off some bloody fangs from a recent kill. The Rabid Wolf Spider (Rabidosa rabida) is just cool looking, and it has an awesome name. Wolf spiders, in general, are hairy, brown or gray nasty looking characters with large bodies and long legs. They are at home in your house or your backyard, as well as in forests and gardens. Their bite can be pretty, and, while they don’t have any dangerous venom, some individuals may have allergic or severe negative reactions to the bite, if the wound goes untreated. 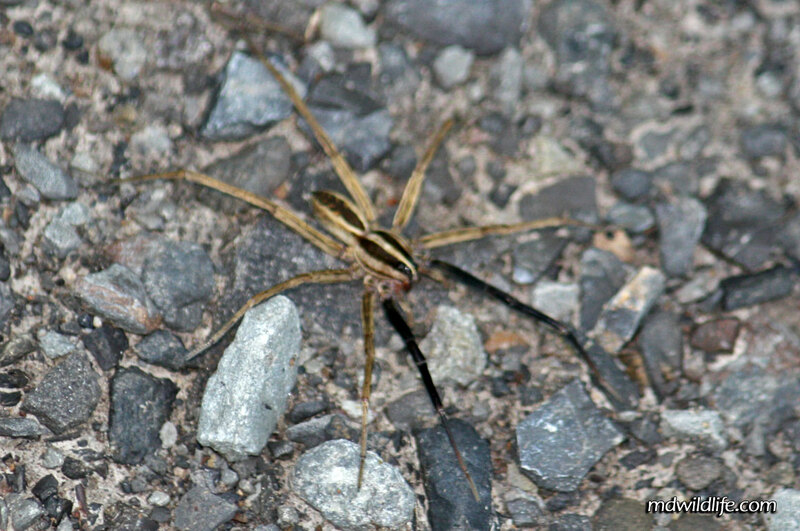 A top view shows the identifiable body pattern of the rabid wolf spider. Mostly night hunters, I caught the spider in these photos at Dan’s Mountain Wildlife Management Area. I was at Dan’s early, before 8 a.m. and had just begun walking the gravel road up toward the power lines and the WMA entrance. I happened to see it scampering across the path in front of me and as I walked toward it, it froze in an attempt to blend into the rocks and sticks along the gravel path, but it was too big to blend. I took a few shots from above and the body pattern helped me identify the species, but when I crouched low to get the face, it started to take a few steps toward me. I backed up and used my 250 zoom lens to get it on his face. It wasn’t until I viewed the photos afterward that I saw the flesh blood dripping from its fangs. I figured the spider must have done some successful hunting the night before and now was heading home. When I look back, it gave me some time and I wish I had switched out for my macro lens to get that great “spider eyes” shot, but the photo above is still one of my favorites. 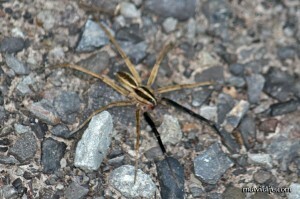 I haven’t spotted a Rabid Wolf Spider on any of my other journeys, but I look forward to seeing one again.